This month's edition of The Weekend Gourmet Dines Out is a first for us: we're featuring more than one restaurant this month. Michael and I recently sampled new, seasonal menus at several restaurants, so I'm sharing Wendy's Best Bites this month. We recently were invited to California Pizza Kitchen to sample their expanded menu options. If you think that California Pizza Kitchen is just about their amazing gourmet pizzas, then think again! They also offer plenty of non-pizza menu options to suit a wide range of tastes. 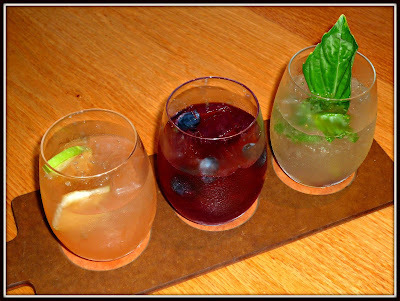 Our dinner visit started with a fun Summer cocktail option: the Sangria Flight, which features a trio of 3-ounce servings of their Orchard, Red Berry, and Seasonal sangrias. It's a perfect way to taste a variety of cocktials. All three sangrias in our flight were fruity and refreshing, the perfect way to start out our meal! Next out of the kitchen was a salad, flatbread, and a pizza. The Bianco flatbread cooked up perfectly crispy and thin and featured whipped truffle cream, Gorgonzola, mozzarella, and fresh sage. This veg-friendly starter paired perfectly with the exotic Moroccan-Spice Chicken Salad. This creative salad features grilled chicken, roasted butternut squash, dates, avocado, almonds, beets, egg, and dried cranberries tossed in a tangy Champagne vinaigrette. The flavors and textures of this creative salad were out of this world! For our featured pizza, we opted for the Roasted Garlic Chicken. This gourmet-inspired pizza included juicy grilled chicken, caramelized onions, fresh mozzarella, parmesan, green onion, and cracked black pepper. We really enjoyed the flavors of this pizza -- and the crust was perfectly cooked! As we enjoyed our pizza and salad, a duo of perfectly cooked wood-fired meat entrees were brought to our table. 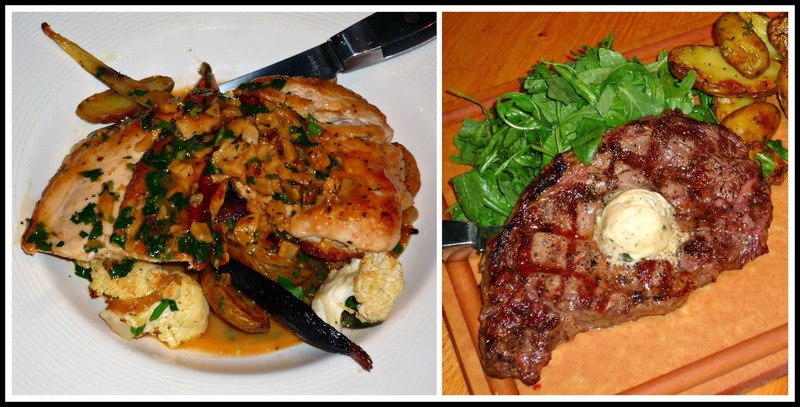 We shared a Wood-Fired Ribeye and Roasted Garlic Chicken with Seasonal Vegetables. The ribeye was tender and juicy, topped with blue cheese butter and served with a side of roasted fingerling potatoes. The garlic chicken was the juiciest chicken I've had at any restaurant, and it was incredibly flavorful all the way to the bone. The chicken was served with cauliflower and a delicious lemon-garlic pan sauce. 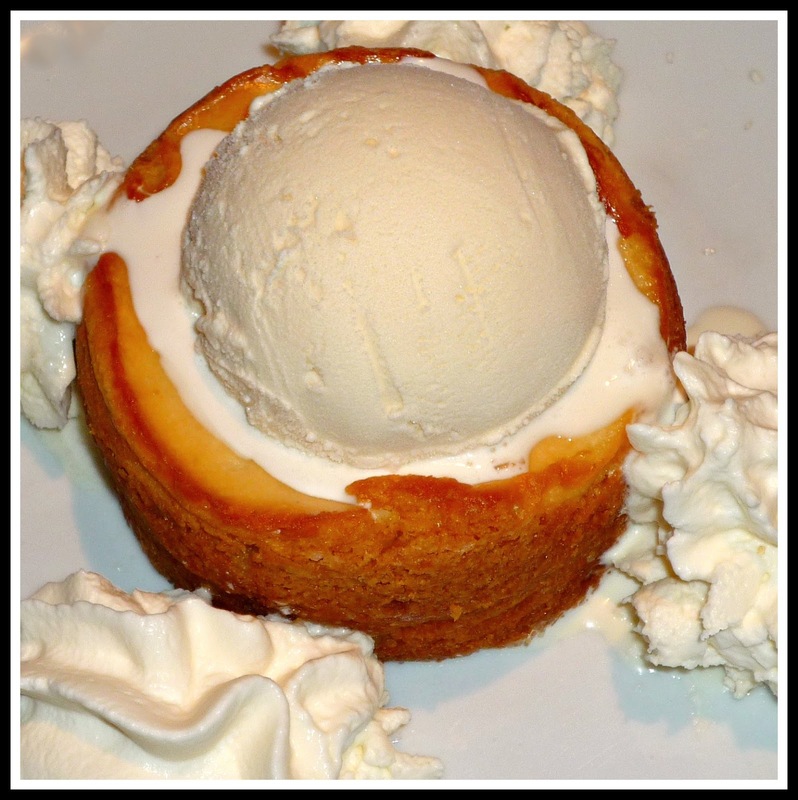 We were stuffed, but the manager told us we simply had to try CPK's warm Butter Cake a la mode. We never have to be asked twice to share dessert, and this one was a real keeper! The cake was warm and creamy -- reminiscent of a warm cheesecake with vanilla undertones and a cake-like crust. This rich, comforting cake was served with a scoop of vanilla ice cream and housemade whipped cream. The portion size was perfect for sharing. Trust me, this dessert is a must have for any visit to CPK! From start to finish, our meal was flavorful and perfectly executed -- especially the amazing Roasted Garlic Chicken. CPK isn't the only dining out experience we had this month! 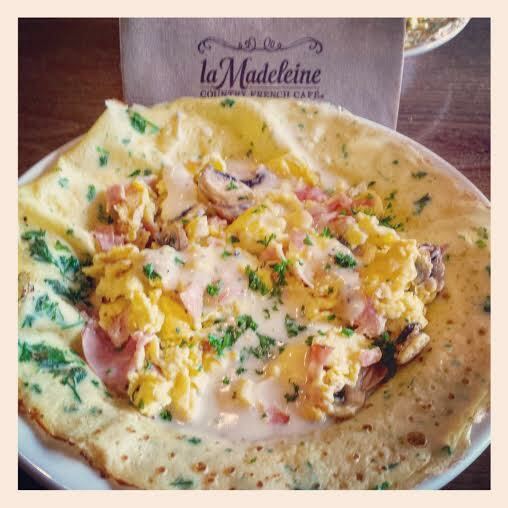 We were also invited to La Madeleine to try their delicious new Custom Breakfast Crepes. Creamy eggs are scrambled with your choice of three additional ingredients, then served in a house-made herb crepe and topped with a creamy Gruyere cheese sauce. My custom crepe featured ham, mushrooms, and creamy goat cheese! It was hearty and full of flavor -- and perfect for breakfast or lunch. If a warm, toasted sandwich is more your thing, then I recommend you give Potbelly Sandwich Shop a try! Potbelly has more than 300 locations across the country, but they're a fairly recent addition to the San Antonio culinary scene. 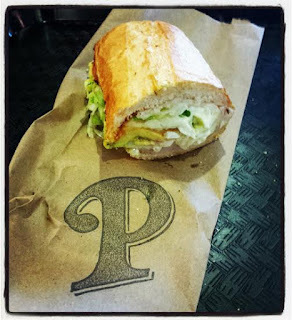 We were invited to stop by Potbelly to sample their sandwiches, and we were very impressed with the quality of their sandwiches! During my visit, I had the Turkey Breast with Swiss sandwich, which was perfectly toasted. The turkey was tender and juicy, and the bread was toasty warm outside and soft inside. To up the flavor ante on my sandwich even more, I added some fresh avocado to my sandwich after it was toasted. I ended my meal with one of Potbelly's warm, fresh-baked oatmeal chocolate chip cookies. This cookie was buttery with lots of gooey chocolate chips, and it was the perfect combination of chewy and crunchy. It's a large cookie, making it perfect for sharing with your dining companion -- if you're so inclined! 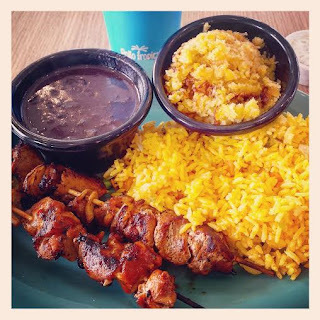 Finally this month, we tried Pollo Tropical's juicy, flavorful seasonal Chicken Skewers. These skewers feature chunks of tender, citrus-marinated chicken. They're flame-grilled, and each two-skewer serving comes with a choice of Pollo Tropical's signature side dishes. I opted for their Yellow Rice with Vegetables, scratch-made black beans, and Caribbean Corn Casserole. This meal was flavorful was filling, but light...the perfect lunch for a busy workday. If you want to try these Chicken Skewers, visit your local Pollo Tropical soon...this seasonal item is available for a limited time only. Be sure to check out the signature sauce bar to pick out a dipping sauce to accompany your skewers -- I especially like them paired with the cilantro-garlic sauce. Disclosure: The restaurants featured provided us with a tasting of their signature items to facilitate inclusion in this article. As always, all opinions expressed are solely my own.